Peanuts are not only a food, a source of oil (and a possible replacement for diesel fuel) … did you know that you can also “wear” them? In 1937, Imperial Chemical Industries (ICI) patented a technique to make a synthetic fibre from peanuts called Ardil which could be woven like wool. The shortage of wool for uniforms during World War II encouraged ICI to invest heavily in the project. The British Government also encouraged the project as part of an economic development program for East African farmers. During the testing period, a sample of Ardil was sent to the director of an ICI plant in India for evaluation. To test its strength, he had a carpet woven from the fibre. For years, the carpet apparently showed little signs of wear. When the war was over ICI was still keen on Ardil. So in 1946 it invested £2.1 million in a new plant in Dumfries, Scotland, and the new fibre went into full production. The Ardil factory became a landmark with an imaginative design and a 33m high tower (demolished in 2009). 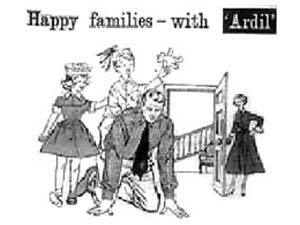 The fibre was marketed under the catchphrase “Happy families with Ardil”. The worldwide push during the 1950s to sell Ardil as a substitute for wool had the Australian wool industry worried (a “threat” reported in the Sunday Herald on June 28, 1953). But despite the catchy slogan (or perhaps because of it!) Ardil was not a huge success. ICI’s plan was to produce thousands of tonnes a year but the Ardil project soon hit problems with a fall in wool prices, rising costs of raw peanuts and competition from other artificial fibres such as Terylene (also made by ICI) and Nylon. The final problem was a shortage in peanuts linked to the failure of the East African peanut scheme. Ardil is technically classified as an “azlon” (a fibre made from regenerated protein fibres). Nowadays there is renewed interest in alternative fibres and research on peanut fibre has been carried out again in the United States. Who knows, one day we may be all shelling out for new clothes grown by your friendly local peanut grower!